I was looking for a gamer laptop which does not cost me more than 800 bucks. And as a laptop that I would like to use to game a lot, I was searching for a Windows 10 device that has minimum 8 GB of RAM, 15″ with full HD screen (IPS was a plus), decent GPU to game, and must have SSD. I want an SSD laptop to have fast Windows boot. Let’s go to the details, first, the negatives of this Dell Inspiron 15 7559. The keyboard comes with number pad, but the keys are slightly smaller than standard numpad you often see. Overall keys are comfortable to type, and it is a backlit keyboard, white color lighting, which is useful when you game in the dark room. The other minor negative is, Dell Inspiron 7559 does not include an optical drive. I think Dell wants to leave spaces for important specs, like the storage or memory upgrade slots. Also the absence of the optical drive makes this laptop feel lighter than those that have CD/DVD drive. Why this Dell Inspiron i7559-763BLK? I am very happy with this Dell Inspiron 7559 SSD, it loads Windows 10 up in about 10 seconds, on off in about 2 seconds, and there was no stutters that you sometimes have with non-SSD computers. The pre-installed 64-bit Windows 10 operating system is installed on the SSD, therefore this machine has lightening fast booting time. It comes with a non-touch 15 inch full HD IPS screen, check out this page if you are searching for Dell touchscreen laptop. If you are used to the IPS screen on your tablets or mobile phones, you will be happy with the screen of this laptop. The viewing angles of the display is pretty good, and it has decent contrast and brightness. I actually prefer this Dell screen than retina display, as retina display hurts my eyes somehow. Also, another thing, the nVidia 4GB 960GTX graphic card, combined with 1080p full HD resolution, my games and movies run waay better than any other screens. 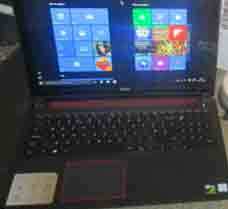 It is positive to have a laptop that have good specs and good screen. The Dell Inspiron i7559-763BLK2 screen is also a matte, anti glare, so to use your laptop in any lighting environment is convenient. Never tried under sunshine but used it on a sunny day in Starbuck, had no problem with the screen. The skylake quad-core i5-6300HQ CPU is almost as same as the usual i7 Intel processor, however this Core i5 6300HQ cannot do hyperthreading as the i7 does, you won’t likely see the difference, unless you are running multi-threaded Windows software. Wikipedia explains more about this CPU. The DDR3 8GB pre-installed memory or RAM is located in one of two slots, this means, while it is not necessary, you can still add another RAM to the empty slot, to upgrade the memory. It is a PC3L 12800 @1600 DDR3. The laptop gives heat and noise when you run mid to heavy resource software, but it is overall a quiet device, and the cooling system handles quite well, the GPU stays under 70, and 75 for the CPU, while for standard use, will go on around 50 degrees. This Dell Inspiron i7559-763BLK comes with two slots for storage. The default storage, which is 256GB SSD, is located in the m.2 slot, and another slot is a SATA bay, which you can put another storage, be it a 2.5″ hard drive, or another 2.5″ additional SSD. There is only one screw to remove the cover to access the storage bay, upgrade the RAM, or checking the cooling system, so upgrade is very easy but not necessary. If you plan to do the storage swap, I suggest you to let the SSD there, as the operating system is installed there, and other heavy programs you can leave them there, to have speedy running laptop. The battery is an internal 6-cell 74 Wh battery, with the life performance above laptop’s battery life in average. With many different brightness settings, I will get 6-8 hours battery life, and about 3-4 hours battery life on gaming. Battery life is better than expected. Overall, this Dell Inspiron 7559 is the nicest laptop I have owned. Full HD 1080 IPS screen with good color production, fast boot speed SSD, nice backlit keyboard, pretty good GPU and CPU which is comparable with those 1k+ gaming laptop, with less money. Recommend this Dell Inspiron i7559-763BLK over overpriced gaming laptops! I purchased a Dell i7559 in December 2015(Pre-installed Windows 10 pro), it’s pretty much new and I’ve been noticing there’s been a fatal issue going on with this laptop. Every time I log in to my account after few minutes it auto logs off(Not restart). It cut’s off the ssh connections and any other similar to that. Sometimes it do very frequently like every 4-5 seconds or sometimes 3-4 minutes. I ran all the possible test like H/W test and dell diagnostics but no issue is found. I also checked screensaver is off, power settings are checked to never go to sleep. I’m wondering what’s wrong going on here. Please help me out to fix this issue.